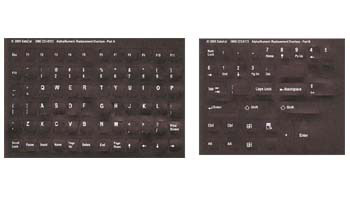 Alphanumeric keyboard labels replace worn key printing to give old keyboards a new life. White letters on black background for black keyboards. Also available in black letters on beige background for light keyboards. Made of Lexan® polycarbonate and printed sub-surface for durability and comfort. Standard Size Alphanumeric Keyboard Labels - available in black letters on beige background and white letters on black background.